Synapse has developed a free-to-use interactive map of power plants in the United States using data from the U.S. Energy Information Administration and U.S. Environmental Protection Agency. This file contains a user-friendly Google Earth map that displays information on location, fuel type, electric generation, generating capacity, ownership, and emissions for over 9,100 power plants across the country. This file contains complete 2016 and 2017 data, as well as preliminary 2018 data through December 2018. To download the map, please fill out the form below. You will receive an email with a link to download a “.KMZ” file that can be opened in Google Earth. Once the file is open in Google Earth, right-click it and select “Save to My Places” to store it on your computer. Note that this map is viewable on your smartphone or tablet through the Google Earth App but is best viewed on your PC or Mac. Please be assured that by entering your email address to request the map that your email is not being shared, sold, or added to any mailing lists, including Synapse's newsletter (click here to subscribe). We will ONLY use your email to send you updates on this interactive map. 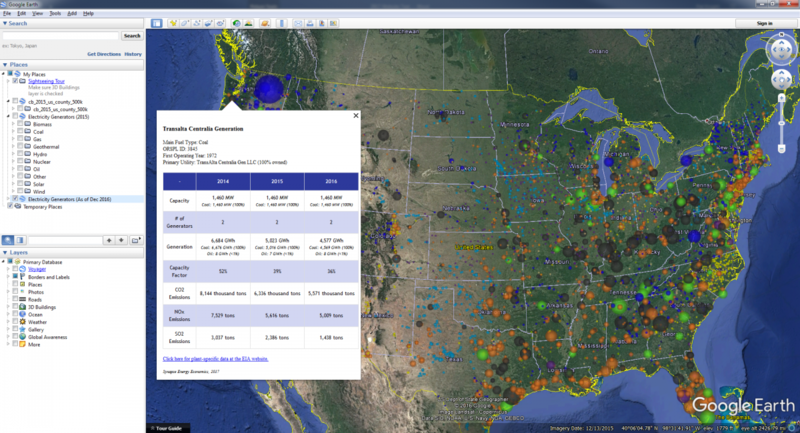 For assistance related to the Interactive Map of U.S. Power Plants, contact Pat Knight.